These high quality Natural Kraft paper shopping bags have serrated edge tops and sturdy paper twisted handles. Made in the USA. This Natural Kraft Shopping Bag Assortment contains 300 Bags Total: 150 Cub (8in. x 4-3/4in. x 10in. ), 100 Vogue (16in. x 6in. x 12-1/2in. ), and 50 Queen (16in. x 6in. x 19in.) bags. 60# paper weight. 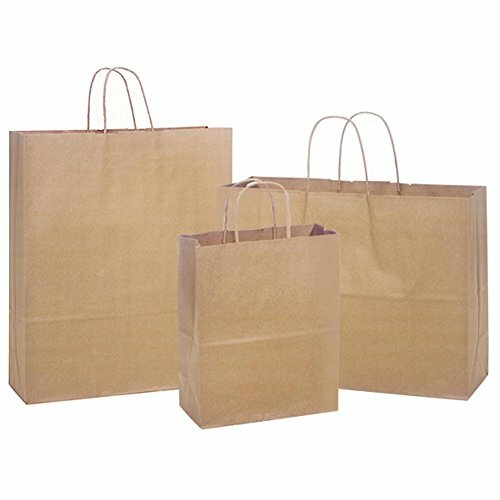 These high quality Natural Kraft paper shopping bags have serrated edge tops and sturdy paper twisted handles. This Natural Kraft Shopping Bag Assortment contains 300 Bags Total: 150 Cub (8in. x 4-3/4in. x 10in. ), 100 Vogue (16in. x 6in. x 12-1/2in. ), and 50 Queen (16in. x 6in. x 19in.) bags. Pack of 300 bags in 3 different sizes.